This week’s column concludes the story of the great Armistice Day parade, held in Wayne on November 16, 1918, just five days after the cessation of hostilities between Germany and the Allies in World War I. Described then as “the finest parade ever seen in this town,” it can still claim that distinction in the minds of many of those whose memories span the intervening 38 years. The group or Wayne citizens, young and old, who, with a detachment of Marines from League Island, headed the long parade, were followed by a local Italian band of 24 pieces. Members of this band all wore colorful uniforms with military dress chapeaux. Behind the musicians were the local Italian citizen celebrants of Wayne, some 75 in number. In their midst was a Roman chariot, driven by one of the town’s best known citizens, Hyacinth D’Ignazio, who by the end of the parade had shouted himself hoarse with his cries of victory for the allies. Among those who followed after this contingent in the line of march were members of the various societies of St. Katharine’s Church. Then employees of the Wayne Iron Works, prominent among them “Big Man” Houck, and a small band, featuring the music of snare drums, with about 50 members of the Wayne Men’s Club, followed. The Wayne Plumbing and Heating Company’s seven handsomely decorated automobiles, with their placards proclaiming that “Liberty Will Never Die,” drew rounds of applause from onlookers. Among the interesting sidelights of the story of the Wayne Armistice Day parade is the one of the plane that suddenly circled overhead as the marchers went along North Wayne avenue. At its controls was Lieutenant J. Brooks B. Parker, of Strafford, who had come from Washington, D.C., to take part in the local celebration. Unfortunately the message of felicitation which he dropped from his plane caught in electric wires overhead! Still another story has to do with the bounteous supper served the visiting Marines from League Island by the members of the Wayne Red Cross Branch. Not to be outdone by the latter, members of the Wayne Saturday Club threw open the doors of their clubhouse that evening, so that the Marines could enjoy a dance with the local girls. To the comprehensive story told in “The Suburban” last week, of the 50 years of service rendered to this community by the Radnor Fire Company, this column would add still another chapter this week. It is not one of fire, accident, disaster, but is the story of this community’s celebration of Armistice Day of 1918, that never-to-be-forgotten November 11 when World War I ended. It was a celebration of which Radnor township was proud in 1918, an event planned for the community by the Radnor Fire Company. The long procession, which started from in front of the firehouse shortly after 3 o’clock was headed by Chief Marshal Charles E. Clark, whose picture appeared in last week’s special anniversary issue for the Radnor Fire Company. Following him were four of Radnor’s “finest mounted,” including Township Commissioner John Kent Kane, “looking every inch a cop”; Sergeant Wilmer N. Clemence (later Captain) and Officers Burke and Harry Hatch. After them came a detachment of Marines from League Island, under the command of Lieutenant Fegley, and a group of “grizzled Civil War veterans and some Spanish-American veterans not so grizzled,” headed by the Bryn Mawr Band of 20 pieces, under the leadership of Herman Giersch. Wayne’s own Company “B” of 60 men came next, headed by Captain Winfield L. Margerum and Lieutenants Norman Coudert and Herbert Plimpton. Of this group “The Suburban” writes, “The members of Company ‘B’ never made a better appearance on parade.” Company “B” was followed by the “Red Cross phalanx” comprised of about 100 members of the Wayne Branch, all dressed in their “garbs of mercy.” Next was the local Girl Scout Troop with their leader, Miss Nancy Hallowell. They passed by “in perfect columns of fours, looking very natty in their uniforms of brown.” Grouped with them was a troop of Boy Scouts, led by Scoutmaster Arthur E. Post, nearly 100 strong and led by the color guard and bugle corps of five pieces. Among the several groups from local schools the first in line was a squad of Radnor High School boys, led by Dr. Albert L. Rowland, then superintendent of schools. who wore the uniform of an officer of the Home Defense Corps. Following them was a group of some 125 pupils of the Radnor grade schools, headed by J. Kenneth Satchell, principal of the high school. 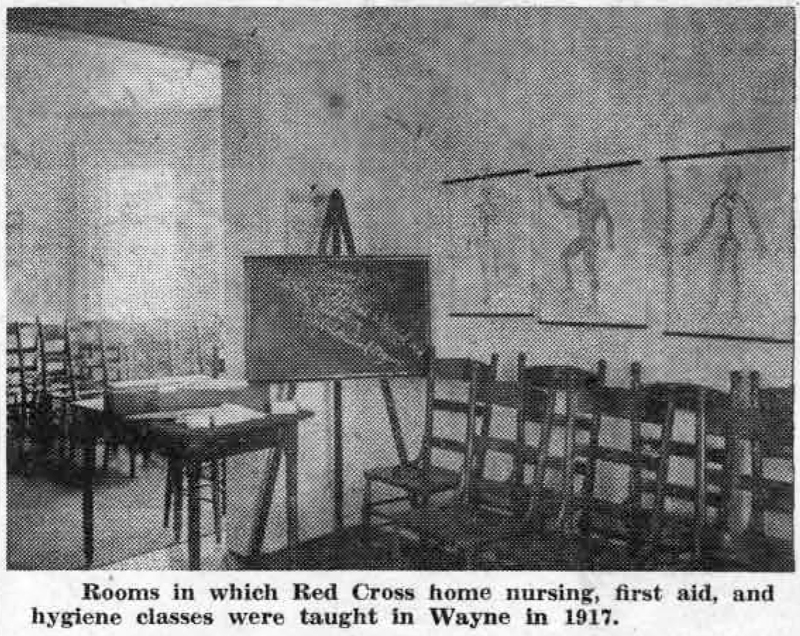 As related in last week’s column, the Saturday Club immediately offered the facilities of its clubhouse for an emergency Red Cross Hospital when influenza reached epidemic proportions in Wayne and its environs in October, 1918. As soon as the main assembly room of the clubhouse had been filled to capacity, a “tent” was added. Actually, the “tent” was a frame building, quickly put together. On Monday afternoon, October 14, orders were given for “a weather-proof wooden structure 40 x 18 feet, with sash windows, steam heat, electric light and telephone service.” Four days later, on Friday, October 18, this building was completed and in operation. It stood on ground to the rear of the Central Baptist Church parsonage, and adjacent to the clubhouse. Credit for the accomplishment of this seemingly impossible task went to J.D. Lengel and his workers, who labored both day and night. For the most part, this new section of the hospital was devoted to children ill with influenza, while the main building was given over to adults. All questions in regard to admission to the hospital for patients were referred to the social service workers at the Neighborhood League, once their doctors had recommended such admission. It was these workers who supervised transportation to the hospital as well as return home afterwards. There was frequently much follow-up work to be done, as well as the temporary use of hospital blankets, hot water bags and other comforts. One of the outstanding features of the Red Cross emergency hospital was the diet kitchen, set up in the basement of the main building under the supervision of Mrs. Phillipus W. Miller, Mrs. E.W.S. Tingle and Mrs. Frederick Embick, all active workers in the Wayne Red Cross branch. Not only did all the food for the hospital patients come from this kitchen but, for a time, an average of 125 meals per day was sent to the homes of those who were too ill to cook for themselves or for others in their households. Front page news in the October 1, 1918 issue of “The Suburban” was a terse and dramatic account of the onset of the most terrifying epidemic this community has ever known. In late September and early October of that year influenza swept the community, as it did many neighboring sections. The story of how Wayne met the crisis is contained in the annals of two of the township’s outstanding organizations, the Saturday Club, and the Wayne Branch, American Red Cross. 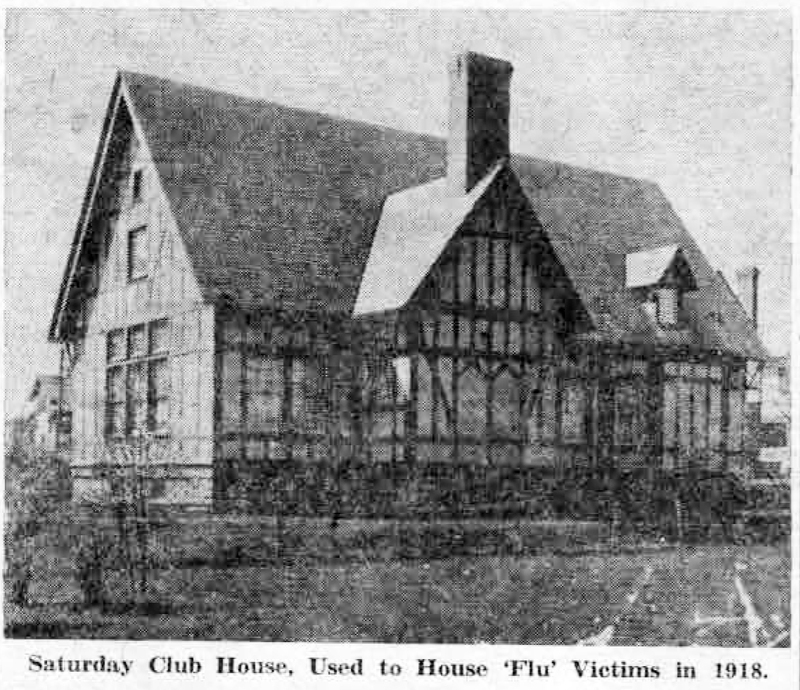 In the clubhouse of the Saturday Club on West Wayne avenue, an emergency hospital was set up early in October, 1918, by government orders, and it was through the efforts of the local Red Cross that it was equipped and manned. According to this early October issue of “The Suburban,” the local situation had already become critical, with several deaths on record. By order of the Board of Health, schools and churches had been closed and all public gatherings, including performances at the Wayne theater, were forbidden. The police force was hard hit by illness in its own ranks, with only two officers and Captain Martin Mulhall on duty. The ranks of the postoffice personnel were also much depleted. It was in this crisis that the Saturday Club made the offer of the use of its clubhouse to the government. The building, with its high ceilings and ample ventilation would prove well adapted to the purposes of a temporary hospital. Arrangements were soon under way, with Mrs. Marshall H. Smith acting in her capacity as president of the local club group and by Mrs. Robert G. Wilson and Miss Grace Roberts acting for the Red Cross. Next came the matter of equipping the new hospital. Cots and other supplies were brought from Red Cross headquarters in Philadelphia by Wayne Iron Works’ trucks, and a Red Cross ambulance was placed at the disposal of the newly established hospital. Within short order, the Bell Telephone Company and the Counties Gas and Electric Company had installed additional facilities where they were needed. Within 24 hours of the inception of the plan, the emergency hospital was completely set up, with 29 beds in orderly rows and ready for occupancy. In a few hours these beds were all filled, several of them with patients whose influenza had already turned into pneumonia. Many more, who should have been hospitalized, had to be refused through lack of beds. Facilities were then increased by the erection of a large tent on the Saturday Club grounds, with beds reserved for children, and an emergency diet kitchen established in the basement of the clubhouse. “Invalid food” was given away at cost, or even given free when family financial circumstances warranted. All food was contributed by members of the community. In all, there were now 50 beds in the clubhouse itself and its adjoining tent. Mrs. Robert G. Wilson, herself a trained nurse, was in charge for the Wayne Red Cross. Other local trained nurses volunteered their aid, as did four deaconesses from the Presbyterian Deaconess House in Philadelphia. Among others who helped were those who had taken home nursing and first aid courses with the local Red Cross branch. A perusal of the bound copies of “The Suburban” of some 40 years ago shows that even as early as 1916 and 1917, the first years of World War I, the home town paper carried each week a column of Wayne Red Cross information under the heading of “Red Cross Notes.” In concise and to the point paragraphs this column brought to the reading public the news on various classes being held at Wayne Branch Headquarters. There were also items of other types of Red Cross news from time to time, none perhaps more interesting than the story of the big Philadelphia Red Cross parade as given in the column recently. The above picture, recently brought to light in present Red Cross headquarters, is evidently that of two adjoining rooms, in which home nursing and probably also first aid were taught. There are three large medical charts on the wall, and notes on the blackboard which indicate that a class might have been in session shortly before the picture was taken. By this time two “emergency” cases had been treated in the emergency first aid room, a picture of which was shown in last week’s column. The first was that of a sprained ankle, which was bandaged by Dr. C.W. Truxal, who was assisted by a local Red Cross volunteer. And, according to the “Notes,” “After this demonstration of the practical work of the Red Cross, the patient desired to become a member of the Branch at once.” The second casualty to be treated was that of a ruptured blood vessel, when Dr. Joseph Egbert was assisted by Mrs. William Henry Brooks, chairman of the local branch. So impressed was Dr. Egbert by the importance of Red Cross first aid that he immediately volunteered his services for the future. Later, four classes in first aid were in progress with plans for a fifth one under way, an evening class for chauffeurs and mechanics. Instructors for these classes were Dr. Alexander H. O’Neal and Dr. Truxal with Mrs. Robert G. Wilson as chairman from the Red Cross branch.